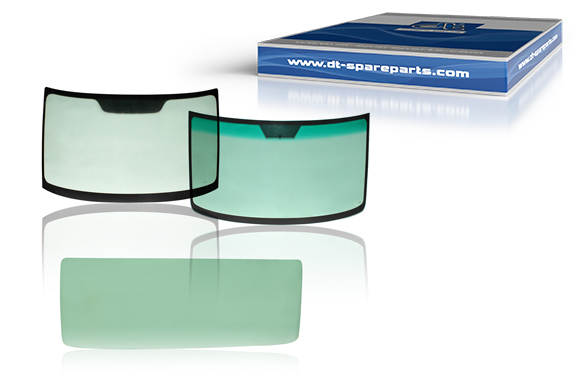 The brand DT Spare Parts offers windshields in laminated and safety glass, as well as door, side and rear windows. All glass windows feature a precision fit for easy installation. Different tints restore the original look of the vehicle. All windows are provided with an ECE certification mark. When glass is broken, it is necessary to find quick and reliable replacement. For this reason, the windshields of the brand DT Spare Parts can now also be sent, if required, in individual packages secure for transport, which are also suitable for CEP shipping - in addition to classical bundling units. First the damaged windshield (WSS) should be removed/detached. It is important that no glass fragments fall into the interior of the vehicle, or damage the paintwork. Any areas of corrosion on the windshield mounting must be revised. In the case of bonded windshields, the adhesive areas on the vehicle must be prepared. Now the WSS can be installed, using the special tool, dual suction, and fixed into place. After the drying time of the adhesive components, the vehicle can be used again.